I’m terrible at drawing faces and figures, especially when I have to draw it from my imagination (without photo reference). It is getting frustrated when there’s an image in my mind but I couldn’t draw it the way I want… so I’ve decided to practice drawing faces… the top two are ref. 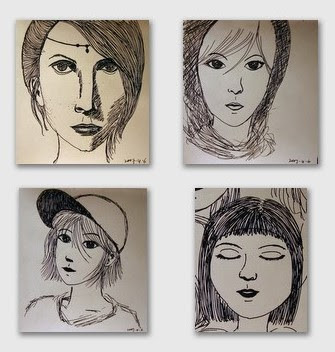 to others drawings, the bottom two are from my ‘imagination’.. but it’s nothing like what I wanted… arrgh. oh thank you! your faces/figure drawings are very good tho’! i really like he top two faces. i do ned practice in face and figure drawing too.